ORIGINAL Dynafoam is an energy absorbing foam! 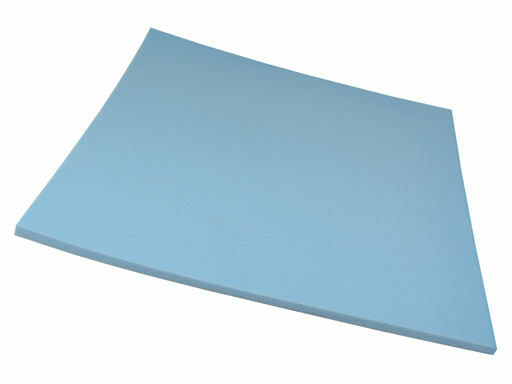 This foam has been recognized as the best seat cushion available for comfort and impact safety. The real value is that when sitting in one position it will form-fit without the development of pressure points. It is open celled, elastomeric, urethane foam that breathes and wicks away body moisture. It's unique ability to absorb shock, it provides an impact safety factor. This seat cushion material is an investment in your comfort. It dramatically increases cockpit comfort - especially on long flights. Firmness: Blue, CF-45, Medium-firm, Most Popular, Recommended by the manufacturer when only a single layer of padding is used. When seated in the half-reclining position that most modern gliders have the 13mm Dynafoam already reduces forces on the spine dramatically, for an upright seating position 25mm thickness is recommended. The absorption of short-time peak forces is of highest importance. After a study was presented the RAF made it compulsory for all their gliding groups to use Dynafoam in their gliders. 1) The cushions are not only helpful in case of a crash, flight instructors confirm to clearly suffer from less problems with back pain. 2) Follow-up tests in Farnborough of more than 5 rough years being used in instruction flights (some cushions for more than 1000 takeoffs) showed, that those cushions (most of them used carelessly and exposed to sun or rain) hadn't changed measureably. The use of Dynafoam cushions in EVERY aircraft, even when they are thin, makes sense in every case and when someone is to small he should ONLY use Dynafoam cushions (or if applicable an absolutely stiff underlay below Dynafoam) to sit on.